Dresser’s car had hit a one-horse delivery wagon owned by Bridgeman-Russell Creamery, which of course spooked the horse. According to the newspaper, “The struggling animal urged by the smashing battering ram behind broke through the steel gates as if they were paper and catapulted high in the air. The machine leaped after that, turned a complete somersault.” James Ten Eyck, the Duluth Boat Club’s legendary rowing coach, happened to be waiting for the ferry when the accident occurred; he “stripped to his undergarments,” dove into the canal and secured a life line to Dresser, bringing him to safety. (The delivery wagon driver was standing on the approach and so was not propelled into the canal.) The horse never returned to the surface, as he was harnessed to the wagon, which essentially kept the animal anchored to the canal floor. The newspaper later reported that Dresser suffered a broken rib and “severe shock.” A dredge derrick later raised the car, wagon, and horse’s corpse. The first accident related to the Aerial Lift Bridge occurred in May, 1930. As W. J. Odenthal of Killdeer, North Dakota, and his son were driving north across the bridge in the brand-new car he had just purchased, the bridge began rising to allow a freighter to pass. Mr. Odenthal hadn’t noticed the stop signs and warning bells telling him to stay off the bridge; while pointing out the sites to his son he had managed to drive past the gate before it dropped. 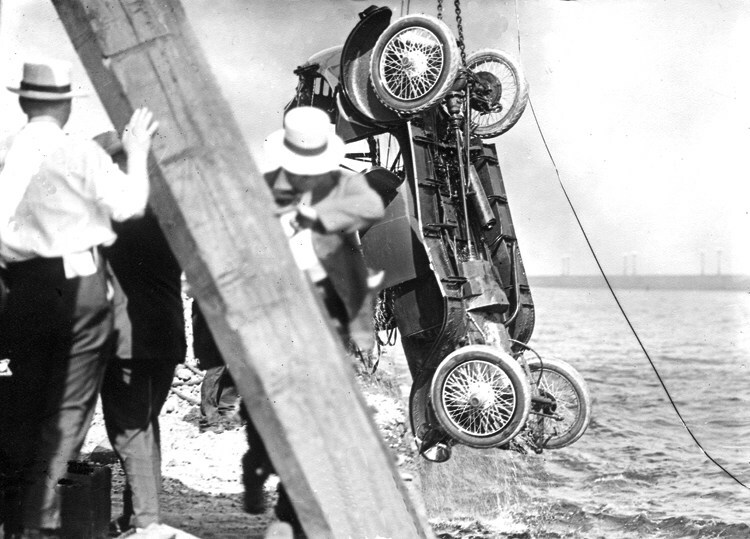 When he reached the end of the span, he continued to drive straight off the bridge and, luckily, onto the pier below. Neither he nor his son were injured, but the car was totaled. Safety measures were later added, including gates at either approach to prevent cars from reaching the bridge. Sadly, young men on the piers were involved in far more dangerous escapades, like trying to hitch a ride on the bridge—a problem that has plagued the operators since the bridge first lifted. On April 28, 1905—just weeks after the transfer bridge began operations—the Duluth News Tribune reported that “half a dozen boys of various ages” dodged the bridge operator, climbed on the girders below decks of the ferry car and rode the ferry clinging by their fingers just thirteen feet above the water. Alone at the controls, Adrian could do nothing to stop them. If they had lost their grip, the boys would certainly have drowned in the canal’s currents. 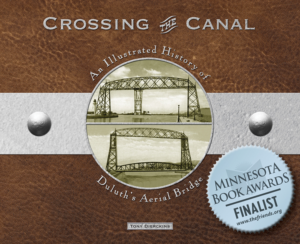 In 1934, seventeen-year-old Melvin Halverson, tried to hitch a ride on the lift bridge. Halverson, who was about to begin his senior year at Denfeld High School in West Duluth, grabbed the edge of a beam on the bottom of the span and held on as the bridge began to rise. Even with a good grip, a person can support his or her own body weight only so long—someone of average upper-body strength can hang from a pull-up bar for an average of between one and several minutes. Halverson’s grip was fleeting at best, and the bridge must stay in the raised position much longer than “a few minutes” to let a ship pass through. His arms gave out when he was thirty feet in the air. He fell to the pier, hit his head on the concrete, and died instantly. Tragedy was narrowly avoided in December 1951, when sixteen year-old Minneapolis resident Beverly Brenner ignored warnings and stayed on the bridge’s sidewalk until after it began to raise. As the bridge moved upward, she panicked. Luckily the bridge was only eight feet above the pavement when she jumped. She suffered head injuries and an ambulance took her to St. Mary’s Hospital for tests. In 1982, a nineteen-year-old man made the same mistake Melvin Halverson made in 1934: he tried to hang from the bridge as it raised. Frank Weber and his friend, Tom Hanna, both of Grand Rapids, Minnesota, were visiting the canal on a Sunday afternoon in September with their girlfriends. Weber, who Hanna described as “adventurous,” thought he could easily accomplish the feat. The bridge was lifting for a small sailboat, and Weber thought it would only raise about twenty feet and not stay up for long. He was wrong. A story that has circulated among UMD fraternity members for years: “back in the day,” they say, one UMD frat’s initiation involved making pledges hang by their arms as the bridge lifted, wait for ship traffic to pass below, and riding down with the bridge. That feat is simply physically impossible. Please do not accept that last statement as a challenge. If she would have stayed on the sidewalk and not moved, she could have safely ridden up and back down on the bridge, but she apparently didn’t know that. She ran back toward the north approach and, when the bridge was thirty to forty feet above the ground, she leaned over and attempted to jump. But she became caught in a V of the bridge’s metalwork, facing west with her legs sticking out toward the lake. As the lift span continued upward, it carried Paplior toward the stationary north tower; dismembered by the rising bridge, she died instantly. Witnesses described the event as gruesome. The bridge’s operators were unaware of the mishap until after it had happened and witnesses called 911.